These early, foundational Dzogchen texts ? clear, lyrical, and rich in metaphor ? were smuggled into Tibet in the eighth century on white silk, written in goat-milk ink that would become visible only when exposed to heat. These five texts are the root of Dzogchen practice, the main practice of the Nyingma school of Tibetan Buddhism. Vairotsana, a master among the first generation of Tibetan Buddhists, reveals here a truth that is at once simple and deeply profound: that all existence ? life itself, everyone one of us ? is originally perfect, just as is. 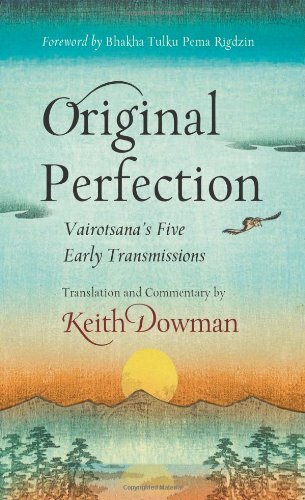 Keith Dowman’s sparkling translation and commentary provide insight and historical background, walking the reader through the truths encountered in this remarkable book. Keith Dowman (translator) has been involved in the arena of Buddhism for more than forty years, living in India and Nepal and in Tibetan refugee society. Gaining inspiration and instruction from the refugee lamas in the holy places of northern India, he received lay ordination in the Nyingma school of the Tibetan Buddhist tradition in the lineage of Dudjom Rinpoche Jigdral Yeshe Dorje and Kanjur Rinpoche Longchen Yeshe Dorje and delved deeply into Vajrayana practice. Raising and supporting a family in Kathmandu, Nepal, he has maintained the essential commitment to the Vajrayana ethos on the fringes of the established Tibetan institution, writing, translating, and teaching to form a bridge from East to West. He is the author or translator of Natural Perfection, The Flight of the Garuda, and Sky Dancer: The Secret Life and Songs of the Lady Yeshe Tsogyel, among others. Pagor Vairotsana (author) was an eighth-century Tibetan translator during the first inception of Tibetan Buddhiam. A disciple of Padmasambhava, monk ordained by Shantarakshita, and lineage holder, he was sent by the legendary king Trisong Detsen to India to study the Dharma. He is one of the main transmitters of Dzogchen to Tibet. The Venerable Bhakha Tulku Rinpoche (foreword) is a holder of the Tibetan lineage of Rigdzin Pema Lingpa and the founder of the Vairotsana Foundation.